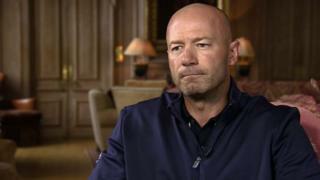 Alan Shearer has agreed a settlement after launching a £9m damages claim over "negligent" financial advice. The 46-year-old former England and Newcastle striker was suing financial adviser Kevin Neal and pensions specialist Suffolk Life. A trial began at the High Court in London on Wednesday, but a lawyer representing Mr Shearer told the judge an agreement had now been reached. Barrister Gerard McMeel said the terms of the agreement were confidential. Lawyers had indicated that the case centred on a pension worth about £4m. The Match of the Day pundit alleged Mr Neal had been "careless" and "dishonest", while Suffolk Life had breached its regulatory duties. Both Suffolk Life and Mr Neal disputed the claims, with Mr Neal describing them as driven by "pure greed and ego". Mr Shearer was also suing two defunct companies, Kevin Neal Associates and Kevin Neal Associates Wealth Management. In his 18-year playing career, Shearer made more than 550 club appearances, for Newcastle, Southampton and Blackburn, and won 63 England caps.